We are now installing biomass boiler & pellet stove systems, running on wood pellets, wood chip or logs, these can supply heating & hot water for individual or multiple properties through district heating systems. The products are very versatile ranging from small wood pellet burning stoves which are ideally suited to a smaller property or as a wood burner replacement to larger biomass boilers running on wood pellets, wood chip, logs or a combination of pellets and logs. We at MCC Heating Services Ltd believe that with continued rising costs of both Gas and Oil biomass will have a large role to play in the future of the heating industry. Biomass Boiler Systems have numerous advantages over our traditional fossil fuelled boiler systems. These can be installed at your home or business. We along with leading manufacturers will design, supply and install wood pellet, wood chip or log gasification boilers. All systems are individually designed to suit your own individual needs. We can supply biomass systems to suit any project from a small stove type boiler in a one bedroom house up to large boilers heating farmhouses, and hotels. Fuel types range from wood pellets, wood chips, logs or a combination of these. We can give you advice on which fuel will suit your needs, how these fuel types will reduce your costs and also on managing your fuel supply. We feel the most important factors for a customer, when considering the possibility of a Biomass system is the reliability of the system and the ability to maintain the system throughout its working life. 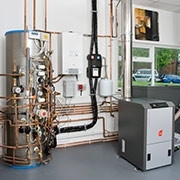 For installation of biomass boilers and biomass systems throughout Kendal, Windermere, Cumbria and all the South Lakes areas, get in touch with MCC Heating Services Ltd today on 01539 263424. Our team are fully qualified and equipped to deal with repairs and installation of all biomass systems.